Evanescence guitarist, Troy McLawhorn, and I go way back. We grew up in the same home town, and our respective bands played together often at little Birthday parties and such gigs in our high school days. As our local notoriety increased, we shared the stage a time or two. I would later switch career goals and move to the other side of the studio glass to become a recording engineer while Troy would go on to become an internationally known rock guitarist. Recently, Troy and I responded to a mutual friend in need. I acquired a guitar: an entry level, student model Ibanez GRG120BDX from a pawnshop for under $100. At that price, the guitar was in serious need of TLC to bring her back up to playable condition, which I also provided as my hobby is guitar restoration/modification. 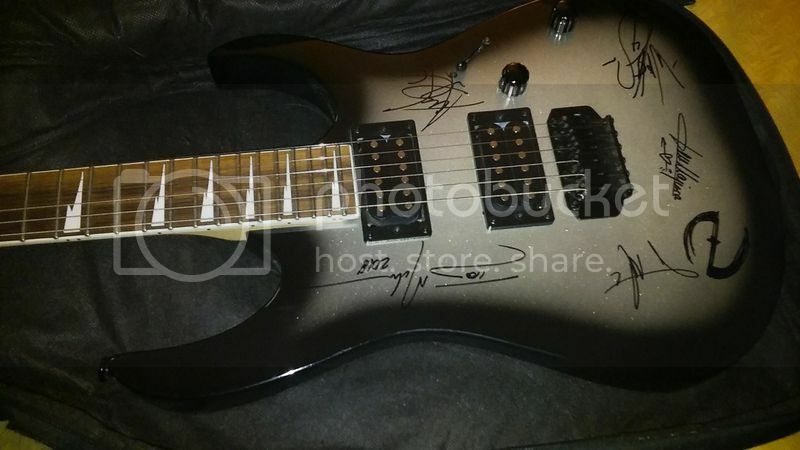 Troy agreed to have Evanescence sign it so it could be auctioned off to raise funds to help out our friend. So began an adventure for Steph and I as we were special guests at an Evanescence show where Lindsey Stirling happened to be the opening act! We made our way south to West Palm Beach Saturday morning so we could meet Troy at the tour buses that afternoon. 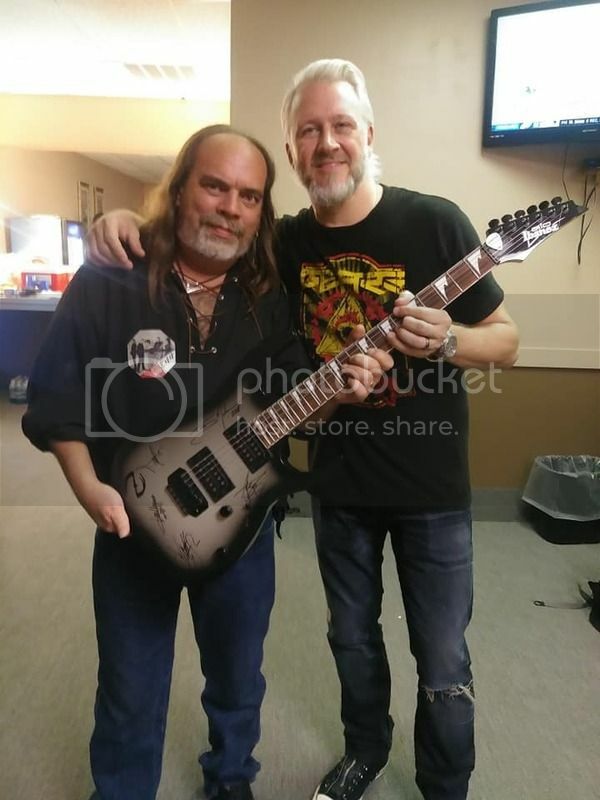 We had to deliver the guitar to him so he could have it signed by the band before the show. After the meeting, Steph and I grabbed a bite to eat, then relaxed in our hotel room while awaiting time for the show. Many of you have seen Lindsey perform, and I’ve read the accounts of her amazing show. She did not disappoint. Her performance was absolutely breath taking! What surprised me were the elaborate set pieces and multiple costume changes that were incorporated in her show. Now, I know she’s well known for that sort of thing. But the reason I was surprised was that it was WAY elaborate for an opening act. Openers generally have to scale back their show so as not over shadow the headliner. But this wasn’t the case here. She played for well over an hour as if was if she were a co-headliner. 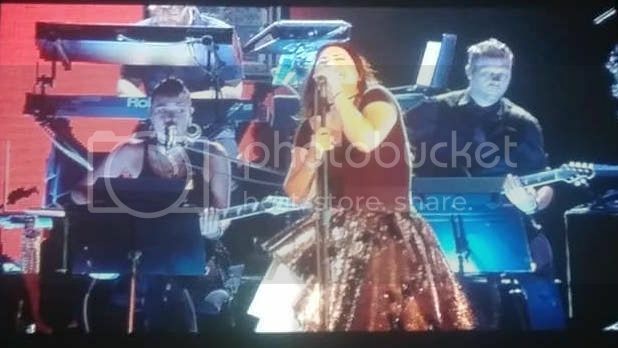 Evanescence vocalist, Amy Lee, even joined her onstage for a number. I don’t know if this was due to Lindsey’s increasing notoriety, or Evanescence’s willingness to let her showcase such an elaborate show. A combination of both, perhaps? Unfortunately, we didn’t get to meet Lindsey. We were guests of Evanescence. Lindsey had a private meeting with her own guests. Oh well, maybe next time. To be honest, I was somewhat disenchanted by this show. This is the first time that Evanescence is being backed by a local orchestra on each stop of the tour. This is quickly becoming a trend as many of us here have seen with our favorite fiddler and Rocktopia. The folks with Rocktopia know how it should be done, allowing all the featured performers, singers and instrumentalists alike, to share the spot light. But this was less like an Evanescence show and more like “the Amy Lee show”. Amy was prominently featured, but the string section of her band were relegated to being seated behind music stands (heresy for a rock musician), played only about half the time, and actually looked bored most of the time. It was in very sharp contrast to the high energy performance Evanescence is well known for. In my opinion, they need to either take a page or two from the Rocktopia play book, or just lose the orchestra altogether. When talking to Amy afterwards, even she said it feels strange for her not having her band mates at her side in the limelight. A couple of high points though: Lindsey reciprocated by joining Amy for a beautiful number with Amy on piano and vocal. Troy’s guitar counterpart, Jen Majura, played Theremin on a few numbers. For the encore, the band came back onstage in their true element, sans orchestra, and did a cover of Ozzy Osbourne’s “No More Tears”. 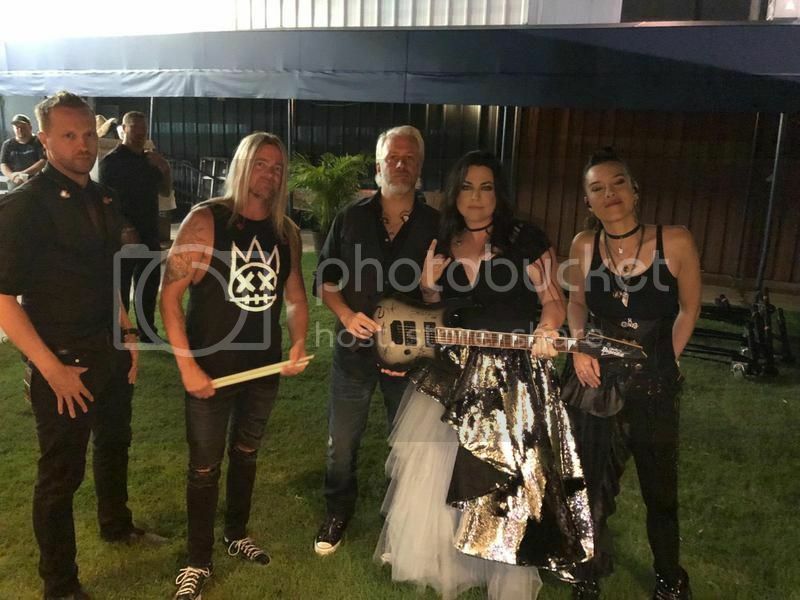 After the show, we were escorted to a meeting area where we got to hang out with members of Evanescence who had expected guests, in this case; Troy, Amy, and drummer, Will Hunt. 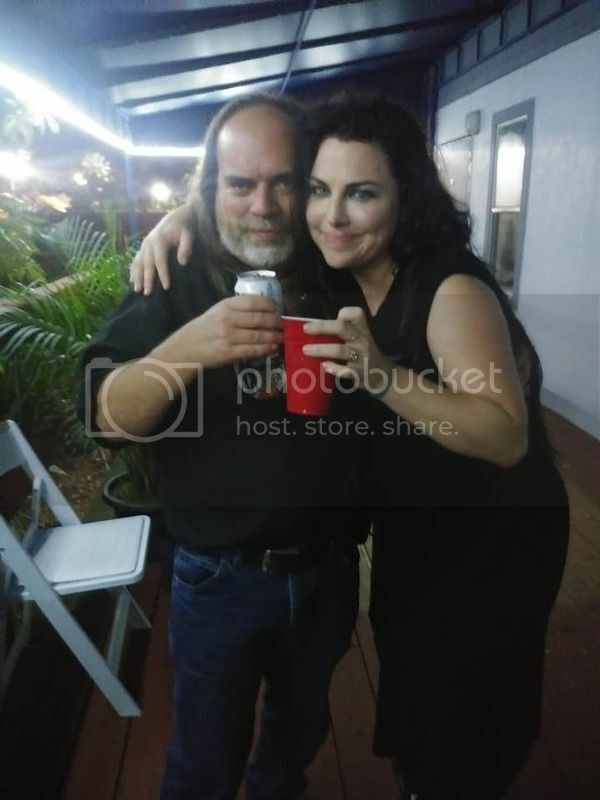 In sharp contrast to a CW meet & greet, hor’d oeuvres were served, as well as a selection of drinks from water or soda to beer and even champagne! Around the time I hit my forties, champagne/wine started giving me heartburn, so I decided to stick with the beer. Steph was thrilled having been a fan of Evanescence since it’s inception. Will had his family as his guests, so I left him alone to spend time with them. Steph did manage a quick photograph with him though. I spent most of the time catching up with Troy. At one point, while Troy was engaged with other fans, I had a nice conversation with Amy. She’s a warm, down to earth person. During our conversation, I made the comment on how impressed I was with Jen’s Theremin playing. Amy’s response: “Oh yeah, she’s great. I have one of the classic ones, but I can’t play it. I drag it out for parties and we make fart noises with it”. I followed Troy to the dressing room at another point to retrieve the signed guitar. On the way, we ran into Jen Majura. Jen is endorsed by Ibanez guitars, and was genuinely thrilled I had chosen an Ibanez to be signed. This led to some good natured ribbing between her and Troy on Ibanez vs Paul Reed Smith. Troy, like former CW guitarist, Ewan Cowley, is a PRS guy. I had to side with Jen on this one. 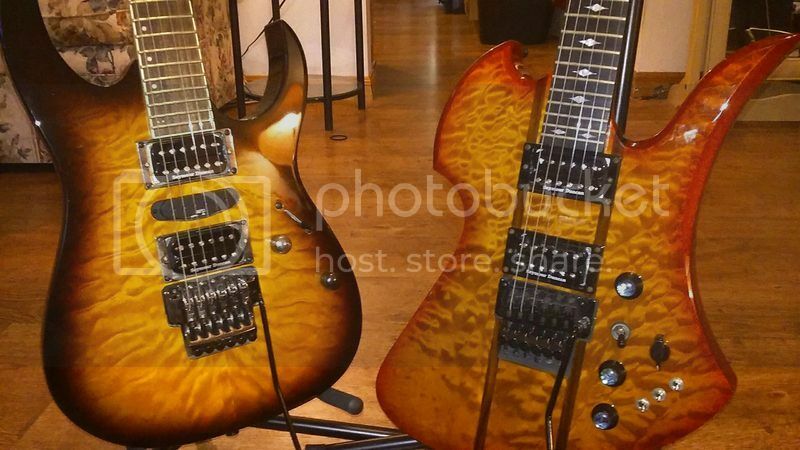 I own a couple of Ibanez’s (Ibanezes? Ibani?) myself. And while I agree that Paul Reed Smith makes some of the finest solid body electrics in the world, I’ve never been aesthetically drawn to them personally. At least not enough to pay the high price demanded for them anyway. I agree, Jen. Pound for pound, Ibanez offers more bang for the buck in my opinion. We were among the last guests to leave at around 1:30am. We had a wonderful time and it made up for a somewhat lackluster show (from a heavy rock perspective anyway). Amy belting it out while Jen and Tim looked bored. 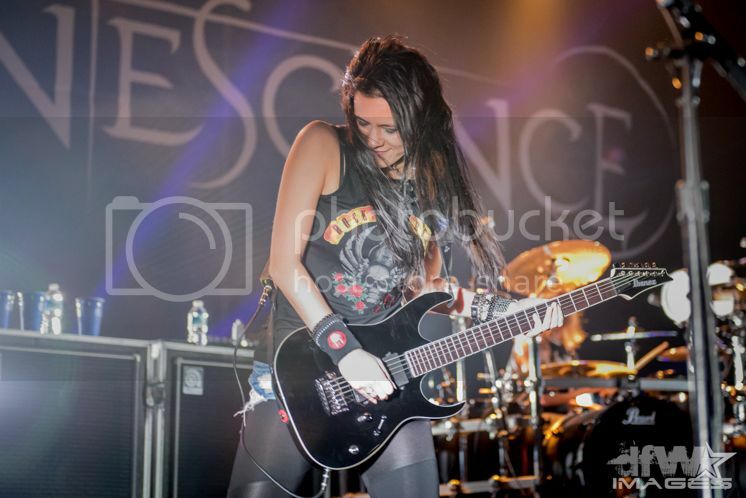 Pro level: Jen wielding her Ibanez RG6USC. Hers is specially built at the Ibanez custom shop to her own personal specifications. In between: Only Ibanez endorsees have access to the Ibanez custom shop. Alas, though I wait by the phone, Ibanez never calls. So I have to do my own modifications. My Ibanez RG370QMSP (left) with her sister, a B.C. Rich Mockingbird, modeling their freshly installed, hand wound Seymour Duncan pickups. My friend, who is an Evanescence fan, enjoyed the show, but he wasn't high on the orchestra or energy level either. I thought I was just having an energy dip after Lindsey's spectacular act or that the energy in the audience was a bit lower after some of the Lindsey-only fans left at intermission. I guess it wasn't just me though. I don't go to a lot of rock shows and the only group I follow closely enough to know the band is Celtic Woman. So for me, the orchestra was fine. I was too far back to see anybody in the band, much less the expressions on their faces. I was just blown away by Lindsey and mesmerized by Amy Lee's voice. Did you get a chance to watch the video I sent you on Facebook? I'll post it here for the benefit of forum members. As you can hear in that video, they're actually playing to orchestral tracks. They could have done this with an orchestra and it would have sounded great! Instead we get Amy crooning to the audience all night. I don't know who's idea it was to tone the show down. Prior to the show, I hadn't met Amy. As Amy is the founder and owner of the Evanescence "brand", during the show I began to wonder if it was Amy getting self serving with her fame. But when I met her and talked with her, I didn't get that impression. It seemed as if she missed the energy of the classic Evanescence show as well. She did mention, however, that this "toned down" show has allowed them to play more prestigious venues. Who knows? That's great that you got to go to the show and that you have a personal connection there. The show did not come close to me because both Lindsey and Evanescence had played a show not long before they toured together. I have followed Lindsey since the early stage of her youtube career and know that Evanescence was a big influence for Lindsey growing up and Amy Lee was her idol. They finally got to connect when Amy invited Lindsey to be featured on their new album. Thanks for the great report and photos, Ron!